I've been playing more with exuberant ctags. It's possible to make ctags recognize limbo source code using regular expressions to identify symbols we want tagged. I added a command "Tag" to the Ctag program that will find and print all matching symbols to the name given as argument. Mouse-chording makes this nice to use. 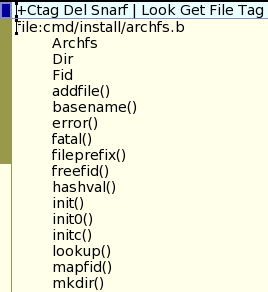 Right-clicking on symbol names will open the source file at that location. Browsing the whole limbo source hierarchy is then made quite easy.